In a Dutch oven, combine potatoes and enough water to cover. Bring to a boil. Reduce heat and simmer, covered, 15 minutes or until about halfway cooked. Drain and let cool to room temperature. Preheat oven to 400 degrees . Slice cooled potatoes about 1/4-inch thick and spread them out on a work surface, such as a large cutting board or sheet pan. (It's OK if they overlap a bit.) Sprinkle slices with thyme, salt and pepper. Brush with about half of the melted butter. 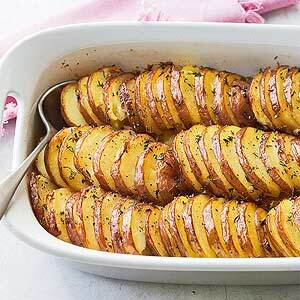 In a 3-quart baking dish, arrange potatoes in rows, one slice leaning on the next. Drizzle with remaining butter. Bake, uncovered, 50 minutes to 1 hour, or until edges are crisp and centers are soft when tested with a skewer.